The city is home to a series of green spaces, where locals come to relax and enjoy recreational pursuits. 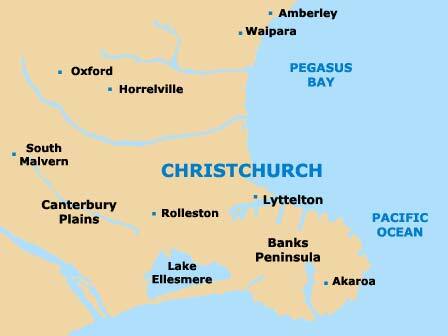 Bisected by the Avon River, the centrally located Christchurch Botanic Gardens lies on the eastern side of Hagley Park, next to Christ's College, the Canterbury Museum and the Arts Centre. 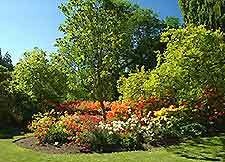 Established in 1863, the gardens cover just over 50 acres / 20 hectares and come with many horticultural attractions, such as a collection of over 250 rose varieties, a rockery, heathers, herbs, a huge herbaceous border and numerous rhododendrons. The central Hagley Park provides the biggest open urban space in the whole of Christchurch and is bounded by a number of prominent roads, such as Deans Avenue, Harper Avenue and Moorhouse Avenue, as well as the River Avon. Hagley Park came into being in 1856 and according to the government, it is 'reserved for use as a public park - forever'. Victoria Lake is a particular highlight here and locals can often be seen sailing their model boats on the water. The Victorian glasshouse named the Cunningham House is worth looking out for at the Botanic Gardens, with its collections of cacti, carnivorous plants and flowering orchids. Lovers of wildlife will enjoy the plentiful wood pigeons and cormorants resident here, while a stroll beneath the century old trees within the Daffodil Woodland provides a cool place to shelter from the midday sun, being reached via the Woodland Bridge. Other attractions include the Bandsmen's Memorial Rotunda bandstand, the Murray Aynsley Lawn, the Peace Bell, the Cockayne Memorial Garden, the Maple Border and the Climatological Station. Families heading to the playground will find an adjacent cafe and toilet block, close to the car park on Armagh Street. Dating back more than 150 years, Abberley Gardens can be found in northern Christchurch, being just off Springfield Road and Edgeware Road. One of the most historic gardens in the city, Abberley is home to many peaceful picnic spots, pathways, seating areas, established landscaping, colourful flower borders and a playground for young children. 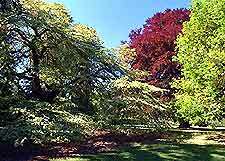 Hagley Park is an enormous parkland, covering over 370 acres / 150 hectares. Containing large playing fields, recreational areas, walking and jogging trails, mature trees, flower borders, forest areas and two large lakes, many notable open-air events are often staged here, while the onsite golf course and nearby Victoria Lake both provide added interest. The lengthy Barnett Park resides on the far south-eastern side of the city and combines natural space with large playing fields, children's playground areas and a stunning valley. Full of natural beauty spots, local wildlife and interesting features, one of the main highlights here is the appealing walking trail around the valley. If you have time, you may like to pop next door to check out the Gethsemane Gardens. Sandwiched between Armagh Street and Kilmore Street, Cramner Square is a small park in the heart of the city. Providing an important area of green, this central spot contains many seating areas and is a popular place for lunchtime picnics, being encircled by mature trees and offering adjacent street parking. Nearby St. Andrew's College and just a few blocks to the north of the Hagley Golf Course, Elmwood Park is known for its large children's playground, which features slides, swings and climbing frames. Playing fields and tennis facilities are also based here. Considerably smaller Plynlimon Park is just down the road and also features a small playground, with a seesaw and swings. The Gethsemane Gardens are situated in the Sumner district, being found on the city's far south-easterly suburbs. Although fairly small, the gardens are beautifully landscaped and overflowing with exotic plants and colourful planting schemes. Notable highlights include city views, walking trails, a historic chapel and Moncks Bay. Of note, keen golfers may like to pay a visit to the neighbouring Richmond Hill Golf Course. Holliss Reserve, to the south of the city centre, is known throughout Christchurch for its impressive children's playground and large duck pond. This park is particularly popular with families visiting the city. Intersected by Worcester Street, Latimer Square lies in the very centre of the city, being bounded by Gloucester Street (north) and Hereford Street (south). It contains an impressive garden with plenty of seating areas, pathways, mature trees, colourful flowers and secluded picnic spots, while just a couple of blocks to the west is the famed cathedral. Murchison Park is an important green oasis in the northern outskirts, being just off the Main North Road (74). With large sports fields, a playground area for children and many stunning natural beauty spots, this location is popular with locals based in the Redwood suburb. The Owen Mitchell Park is a vast and spreading park in northern Christchurch. Containing many pathways suitable for walking and jogging, secluded picnic areas and large expanses of grassed areas, this is just a short trip from the city centre. 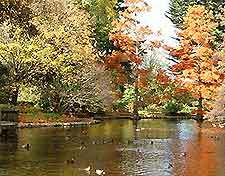 Victoria Park, in the Port Hills area of southern Christchurch, has much to offer visitors to the city. Home to spectacular views of the surrounding countryside, walking trails and picnic spots, other highlights include a playground area for children, a visitors centre and a wealth of native flora and fauna.